After the Nokia Lumia 920 was handled on stage by various Nokia and Microsoft employees, we finally got our turn at playing with the smartphone. The Lumia 920 is not a small device, but for its 4.5" screen it's actually not bad - it's only marginally bigger than a Lumia 900. Still, at 185g it's one of the heaviest smartphones out there. The shell of the phone is a polycarbonate unibody that's 10.7mm thick and the back is curved, which really improves handling. The overall design harkens back to the Nokia Lumia 800, though the polycarbonate is glossier. The horizontal camera placed near the center of the back is a nod towards the Lumia 800 too. The Lumia 920 camera is flush with the back, even though Nokia added the impressively souding optical image stabilization - a first for smartphones. The Nokia Lumia 920 has a PureView-branded camera, but misses on the 41MP sensor - it uses an 8.7MP sensor instead. Still it has the image stabilization and the super bright F/2.0 aperture plus Carl Zeiss lens, and according to Nokia those allow for unrivaled image quality in low-light conditions. The phone also comes with three Lens apps be preloaded - SmartShot, Cinemagraph and Panorama. "PureView" stands for innovative camera features, not a megapixel count (Nokia has been saying that right from the start, that's why the 808 PureView shoots 5MP images by default). By the way, the plate surrounding the camera on the back as well as the keys on the side of the device are made of ceramic that Nokia tells us is nearly impossible to scratch. Moving on to the front of the Lumia 920, its IPS LCD screen features the same curved glass we saw on the Lumia 800 (Nokia calls it "2.5D") and uses some brand new technologies that Nokia refers to as PureMotion HD+. The image on the screen appears as if painted right on the very surface of the screen - something we really appreciate. Even though it's not an AMOLED, the viewing angles are great and so are the colors. The new display tech automatically adjust the screen settings to fit the ambient light. The screen glass is Gorilla glass and there's Synaptics touch tech. As we saw during the demonstration, the screen will detect touches even if you're wearing gloves but it's even better than that - you can use your fingernails (good for the ladies) or even use your car keys as an improvised stylus. 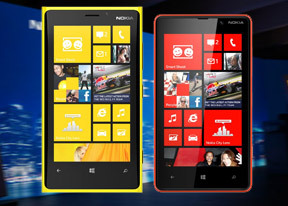 The Nokia Lumia 920 comes with two wireless technologies that Nokia thinks will be huge - NFC and wireless charging. NFC comes into play with the new Bluetooth speakers, but also for content sharing and NFC features from WP8. As for wireless charging, the 920 supports Qi technology, so it will work with any Qi-compatible charger. There were three chargers that Nokia showcased - a somewhat boring looking plastic charger, a soft Fatboy pillow charger and the JBL PowerUp Bluetooth wireless speaker. One thing that the Nokia Lumia 920 doesn't have (and we wish it did) is a microSD card slot - you have to rely on the 32GB built-in storage (plus that 7GB SkyDrive storage). The design allows it (as we saw on the N9 and Lumia 800) and the OS supports it too (the new Lumia 820 has a microSD card slot), so we don't know why Nokia decided to do without it here. The battery is also not user-replaceable (a more understandable consequence of the unibody design), but there's a 2000mAh juice pack in there. Official numbers promise 17h of 2G talk time and 10h of 3G talking.